CORPUS CHRISTI, TX – Whether she’s chilling with a soft drink or keeping coffee warm, M.T. Cupp, the Styrofoam container, always seems to be filing up the blue recycling bin with plenty of trouble. 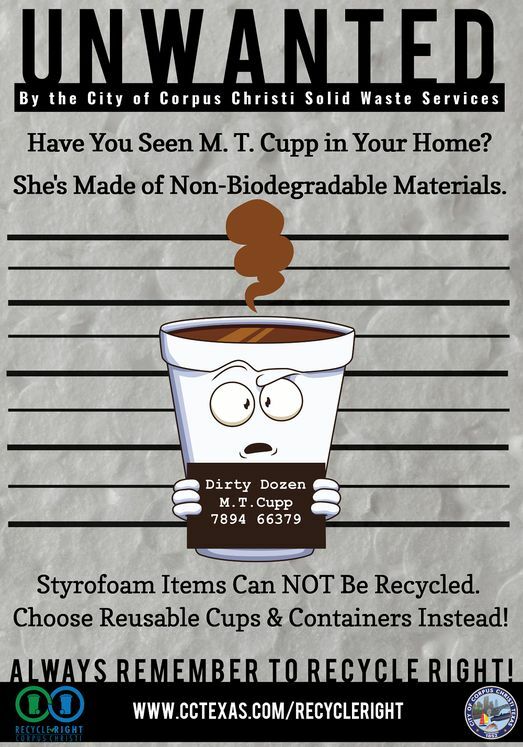 Styrofoam cannot be recycled and does not belong in the blue bin. Please place all Styrofoam in the trash. The City’s Recycle Right campaign is designed to inform and educate the public about how and what to recycle. More details are available at cctexas.com/recycleright. For more information, contact Public Information Manager DeAnna McQueen at (361) 826-2940 or by email at deannam@ cctexas.com.